The information on this page was written with computers in mind, but most of the warnings also apply to mobile devices like smart phones and tablets. Take the cybersecurity knowledge test to see how much you understand about online security and the terminology involved. Once you've evaluated how well you understand the issue, read the information on this page to help you understand Cyber scams and how to prevent yourself from becoming a victim. Much like white-collar criminals, online criminals face far lighter repercussions if they are caught than someone physically robbing a store or bank or someone holding a person for ransom because it is assumed that such crime is not as serious. Cybervictims would disagree. From bogus “computer support” calls to “free” vacations to fake charities to unexpected “government” calls (even threats of pending arrest warrants) scams are perpetrated on innocent victims every day. A robo-call telling you that you've been randomly selected for a special discount, offering credit card debt relief or to win a prize is almost certainly a scam. Don't respond to a call asking if you can hear the caller. That provides a recording of your voice confirming acceptance that can be used fraudulently. You get a call from an “officer” telling you that you're about to be arrested for tax fraud (of course he can help). A new credit card scam where the automated call says there are international phone charges on your card. Don't give out the 3-digit code on the back of your credit card to anyone calling you. That is what the thieves are after. Scammers say they are from or are associated with a well-known company or government agency (e.g. 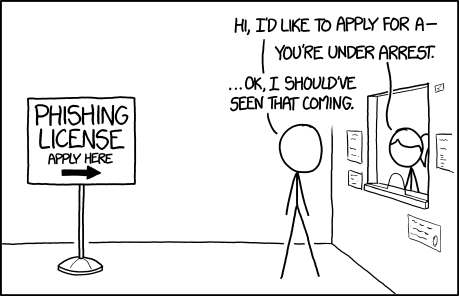 Microsoft, IRS or CRA). This is transfer of trust. They ask to confirm your account number or other details. They ask for remote access to your computer or want you to install software. For more information, visit the Canadian Anti-Fraud Centre for a list of the most common scams. Remember, they called you! so it's their identity that is unconfirmed. Providing information or access to your computer allows the caller to scam you. Just hang up. NEVER volunteer information or respond to their questions. Do not call the number in a pop-up window on your device. Microsoft's error and warning messages never include a phone number. Don't be the next victim! Just hang up. Fraud experts recommend that you let all unknown numbers, even if they appear familiar, go to voice mail. The purpose of their call is to steal from you — your money, your identity, your trust. Learn how to protect your identity. The telephone Caller ID display can be faked. The number showing is no guarantee that the caller is who they say they are. Unless you initiate the call AND have obtained the number from a legitimate source, you have no certainty who you're dealing with. Never depend upon any website provided by the caller. Ensure you use the site indicated on reliable sources such as a recent invoice or billing from the company. Fake websites are common and it is easy to fake a site. If you receive a phone call from a “technical support” person saying that you have a problem with your computer, Just hang up. All such calls are SCAMS. If you have reason to believe the call is legitimate, hang up then look up the number from legitimate source such as an invoice or statement and call them back. In most cases, the company won't know what you're talking about. The person calling you is undoubtedly more technically adept than most users. They will attempt to convince you that your computer needs fixing, then obtain your credit card to bill you for an unnecessary support call. All computers run slower over time. The caller will most likely make the problem worse (they are attempting to steal your identity and/or the use of your computer to attack other computers) as well as sell you bogus anti-virus software or services. The caller will attempt to “prove” they are legitimate by getting you to visit their website. Don't! They aren't located in your country regardless of what their website indicates. Most (but not all) are located in India or similar countries where consumer protection and fraud law are not easily prosecuted. They scammer will then point out the stopped Microsoft services, calling them “errors” and telling them that their computer is about to crash. These errors are NORMAL, but the caller wants you to panic and follow their advice. Most users are confused by the use of the keyboard commands and immediately feel out of their depth. This is intentional. Now they'll get you to enter the same Windows Key + R keyboard combination, then www.google.com (which opens Google) and have you search for an older (insecure) version of TeamViewer. When installed, this program will provide the caller with remote access to your computer without any of the newest security measures. Remember, the caller has no advance information about your computer. All they have is their bag of tricks to try to scam you. Never provide remote access to your computer via TeamViewer or any other product based upon a phone call, email or any unexpected popup warning on your computer. Never follow instructions to navigate to folders or type any instructions via your keyboard. Never provide nor confirm any personal or computer information (including passwords, software versions or serial numbers, credit card numbers, etc.). Never visit websites or install software suggested by the caller. Remote access or unknown software can allow the remote user to do ANYTHING on your computer, including install nefarious software or steal personal information. If you follow their advice, you'll waste your money on software that won't help protect your computer. Worse, it will likely make your computer more vulnerable and you'll become a victim of identity theft and credit card abuse for which you'll foot the bill. Don't be a victim! Just hang up. Many people of all ages have fallen for these scams, and the schemes are getting more complex. If you encounter one, don't panic. Stop and think it through. 7 steps to take right after a data breach. Stay Safe Online's blog has tips and news about keeping your computer and family safe online. Tech support scams — from Microsoft. Cold call tech support scams increasingly common. How to protect yourself from scammers (CRTC). ‘We're with Windows.’ The anatomy of a cold-calling scam. Avoiding tech support scams — from Microsoft. Listen to a scam computer virus call. 15% received a call (22% of those fell for the con). Microsoft takes on scummy tech-support companies has more hints about avoiding getting caught in this massively-profitable racket. If you've fallen for one of these scams, don't be embarrassed. If you were the only victim, the crooks would be out of business. However, you do need to take some immediate measures to limit the damage, starting with reporting the crime. If your computer was accessed, take your computer to a trusted computer professional to assess the damage. Service personnel can look for the signs of problems but no one can guarantee the computer is clean under these circumstances. In some cases the computer many need to have a clean install (data backed up, operating system and software reinstalled, data restored) to ensure the computer is not infected. Your passwords may be compromised. Notify the companies involved and immediately change ALL your passwords. If you used a credit card or provided banking details, you'll need to immediately notify those financial institutions. Notify the police to report the potential identity theft and contact the Canadian Anti-Fraud Centre at 1-888-495-8501 if you have become the victim of identity theft. Do NOT use any number provided in a suspicious email or phone call. Instead, look up the number in a statement or invoice you've received from the company or organization when doing business with them in the past. There are resources that let you check out a phone number. These services depend upon reports from people like you that may have fallen victim to the scam or are simply concerned that it may be a scam. 800notes is a free reverse phone number lookup database built by its users. CallerSmart is a free service (or app) that allows you to find out who called or texted you. "Wait, this isn't the street the county jail is on." Phishing is a form of spam intended to obtain financial and personal information by deceit. It takes advantage of vulnerabilities in some browsers and email programs but depends even more upon people's ignorance. The intent is to steal your on-line identity — a crime commonly referred to as identity theft (see the sidebar). The information gained will be used to gain unauthorized access to your existing accounts or to establish new ones. Crimes may be committed in your name and your reputation may be destroyed. There are huge personal and financial costs if you allow yourself to become a victim — $37 billion in 2010, (down from $56 billion the year before). One reason phishing and other identity theft practices to succeed is that most of the victims are using technology they don't understand. Unfortunately, neither do the politicians making the rules to protect you. They don't use a password manager. Instead, they use the same set of passwords or slight variations everywhere. Rather than learning to use newer software with built-in safeguards, they run obsolete email programs and vulnerable web browsers with obsolete or insecure addons and vulnerable plugins. They are unwilling to learn about risky behaviour or change their habits to reduce those risks. “Spear” phishing is harder to detect. It uses information about you obtained online but which makes the user appear to be someone you can trust. It may appear to come from a friend, but it is a scammer looking to steal from you. The spear phisher thrives on familiarity. He knows your name, your email address, and at least a little about you. The salutation on the email message is likely to be personalized: "Hi Bob" instead of "Dear Sir." The email may make reference to a "mutual friend." Or to a recent online purchase you've made. Because the email seems to come from someone you know, you may be less vigilant and give them the information they ask for. And when it's a company you know asking for urgent action, you may be tempted to act before thinking. Don't take the bait! is a excellent video about phishing from the Bank of Montreal (requires Adobe Flash Player, a vulnerable plugin). Spear phishing: scam, not sport. Phishing involves convincing you that you're seeing information from a legitimate source when you're not. Sextortion scam: What to do if you get the latest phishing spam demanding Bitcoin. 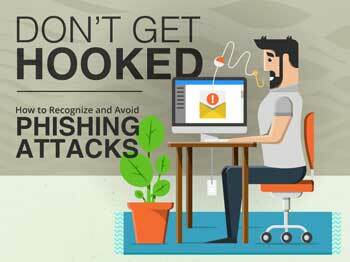 6 tips to avoid phishing attacks. 7 ways to spot a phishing scam. Ad targeting: Trusting merchants, social media, and mobile providers with personal information. Email hacked? Here is what to do. Several excellent older posts have been removed, but check the current listings. I use AntispamSniper, an excellent third-party antispam tool, with The Bat!. They have some excellent suggestions on identifying and avoiding phishing attacks. If you are the victim of identity theft, you can expect to fight to regain your credit rating for years — over and over again. Victims report that it takes months or years to regain their credit rating, only to find that a new report forces them to start all over again. While electronic data can quickly get you into trouble, financial institutions want physical (on paper) evidence that you're not responsible. Becoming a victim is easier than you might think. Let's have a look at the process from the perpetrator's point of view. Remember, YOU are the intended victim of this trap. The “Google Docs” image (shown beside this text) was captured from a fake website. I've seen a similar layout embedded into an email (one of the reasons you DON'T want to allow your email program to automatically load images). 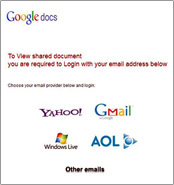 Don't follow a website (or email) link to log into Yahoo!, Gmail, Windows Live, AOL or other email account. The email may simply use fake links to take you to their bogus site. Always use an address sourced from a legitimate location. The message could exploit a bank (most have been targeted), Google Docs, e-Bay, PayPal or any site where you conduct business using a credit card or is protected with a user name (usually your email address) and a password. What Happens When You Click on Fake Links? When you click on these links and enter the requested login information, you are providing the scammer with the information they need to take over your account (each one you provided the login information for). They would probably lock you out of your own accounts by changing passwords. If it is your email account, that account is a key recovery mechanism for your other accounts. The scammer would soon control your social media and other accounts linked to it. All they have to do is click on the “forgot password” link on the various sites then check your email account for the recovery information or links. Next, send an email message to thousands of potential victims (like you) indicating that there is a problem with their account, or that their account will be closed unless they go to the website and re-enter personal information, including their user name and password (or bank PIN). Legitimate businesses will never ask for personal or account information via email. How to view message headers on various email providers from Google help. You can't count on identifying spam by the email sender's address. Scammers often know how to forge headers to make it appear to come from a legitimate company. Recently I've noticed that spam with the same message seems to come from a different email address every time (probably the same scammer using stolen addresses). According to Symantec's 2015 Website Security Threat Report Part I , it costs as little as $0.50 to $10 per 1,000 stolen email addresses on the black market — a testimony as to the poor quality passwords folks use and how easy it is to hack them. See full-size infographic (posted on the ZoneAlarm Blog) to learn how to recognize an email scam. One of the dangers of "enhanced" or HTML email is that stuff can be hidden. See How to unmask fake links. Firefox security features help you avoid problems with invalid or insecure sites. Other browsers may have these features, but Firefox is the only major independent browser. The victim (you) clicks on the link and finds themselves on what they believe to be the correct site (remember, the perpetrator has created the site to look like the original), so they enter their user name or email address and password. Of course, this information is not going where you think it is — you're sending it directly to thieves. Taking your electronic identity (which you've just provided to them on the phishing site), the thieves go to the real site (such as your bank) and log into your account. The information obtained in this manner is then used to either obtain funds from your account or to set up credit in your name. The example above is designed to lure you into providing account information and/or to visit a bogus website where you'll enter that information. A message can also be designed to get you to send money via Western Union or some other method. Get back to me with the details, would definitely refund it back to you once i arrive Hopefully. The sender hoped I'd reply with financial details so they could collect the funds themselves. The use of ALL CAPS in the subject line usually indicates a scam. The inconsistent or incorrect use of capitalization and punctuation indicates that English is not the sender's native language or they have poor grammar skills (the person they were impersonating is a professional writer and editor). The person was supposedly “beaten up” (yet only has “some scratches”). The person had no cash, credit cards or cell phone but was able to send an email to me. The message was sent to an email address that the sender would be unlikely to use when corresponding to me in such a circumstance. The victim could have resolved her issues with a call to the credit card company. The hotel would have obtained a copy of a guest's credit card when the reservation was made (and verified it when the person checked in) and credit card companies provide the necessary help in such circumstances. The real owner of the address did the smart thing and sent out a message to her contacts indicating that the original message was bogus and changed her password to something more secure. Scammers are improving their techniques and their language skills. Grammar is improving and spear phishing techniques. Recent phishing email scams are harder to detect. The sender indicates they are out of contact but in dire need (like the example above). Any attempt to get your user name and password, especially when the form is either attached or embedded in the email message. Attachments are generally unnecessary in most messages. They are useful when sending documents, photos, etc. but an unexpected attached .docx or .zip file should probably not be opened (most such attachments contain scripts that will infect your computer). Altered or unusual links in the body of the message or its attachments. The presence of official looking logos attached to the message (most companies now use images hosted on a server). One of the methods commonly used to scam people are fake links in email messages. infect their computers with malware (turning their computer into part of a botnet that attacks legitimate sites or attempts to infect other computers). Decent security software and detection provided by web browsers like Firefox can help prevent such attacks, but it is best not to click on these links in the first place. Would you click on a link like the following? Send us all your passwords. Get your computer infected here. Of course not. Those looking to steal your identity aren't going to unmask themselves. They tell you the link points to something that engages your curiosity or greed. That's why you can't trust the linked text to tell you where the links actually go. the hyperlink (the actual address where you are being sent). Only the hyperlink itself (the hidden part) determines where the link sends you. Just as placing a Mercedes license holder onto a Ford doesn't turn it into a Mercedes, a misleading description doesn't change the link's destination. If you hover over the link and look in the status bar at the bottom of the program (some browsers show the hyperlink address in a small box above or below the link itself) you can tell the destination without clicking the link (and potentially getting yourself into trouble). Just because the linked text says it is pointing towards a particular Web address doesn't mean that is the real destination. If you are interested in the mechanics of this process, have a look at Cut 'N Paste HTML Editing. It gives some simple HTML lessons and demonstrates how HTML links work. TinyURL: add preview before the address (https://preview.tinyurl.com/c7b7ybm). bitly: add a + after the address (https://bitly.com/16M0Io3+). You're taken to TinyURL or bitly with information showing about the true (full) destination for the shortened link. In these examples, all shortened links point back to this page. Shortened links are common in Tweets (Twitter messages) because only 140 characters doesn't allow for long complex Web addresses. However, they are seldom needed in an email except where the length of a complex address wraps in the email window, potentially causing the link to break. Destination unknown: shortened URLs and your security. Short URLs considered harmful for cloud services (or PDF version). How Can a Fake Site Exist? First of all, people that set these fake sites up and send out the phishing emails wish to remain anonymous. They are breaking the law and don't want you (or the police) to be able to find them after they steal your identity. The provided links are only up for a short time before they are removed by the owners of the site affected or by the legal authorities. Forged links often point to a site in an educational institution where passwords and access are easy to come by. By their very nature, universities house a lot of smart and curious people. Smart as they are, too many don't view the issue of security as their problem. Because of a few people's lax attitudes, many will suffer significant financial setbacks. More recent phishing attempts have provided an attachment to their messages which, when opened, replace the fake site with a form which accomplishes the same nefarious purpose — to get your information using deception. Don't be fooled. An unexpected attached form (or PDF or Zip file) is likely an attempt at identity theft. Even .DOC and similar Office documents can be dangerous. Ensure that you can see the hints when your mouse hovers over a link or other hot spots on your browser. Use stronger passwords. There are complex online password generators as well as software to help remember more complex passwords. I strongly recommend LastPass. Only shop on secure websites (https:// and a padlock symbol in a web address means a safer website than http:// because it is encrypted). Learn how to view the headers in an email message (sidebar), and know the signs of a risky message (read this page completely as phone and email scams have a lot in common). Ensure your security software is current and updated daily. Windows users should ensure that all critical Windows Updates are installed, including the latest service pack. Mac and Linux users need to be vigilant in updating. While not as common, they can be infected. Ensure your browser and email software are current and updated. 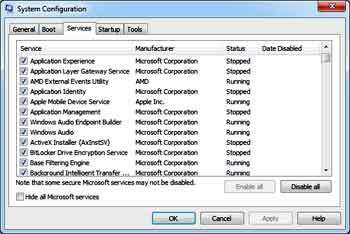 Stop using and uninstall software that is no longer actively supported and maintained. Advanced features are often hidden to provide for a cleaner, simpler look. Remember, software vendors don't have to pay to clean up problems that could have been prevented were these features enabled in a standard (default) installation. If you need help determining how to configure your software and security protection, contact someone knowledgeable. Be careful when selecting your “expert” helper (especially if they call you). Remember, you're putting your trust in this person. I provide these services in Greater Victoria on the west coast of Canada. Use whatever tools your ISP makes available to identify potential spam, phishing and other problematic email messages. Check your ISP's help or support website or call their help line. I strongly recommend hosting with Islandhosting.com. They specialize in website hosting and can provide personal support when you need it. Their friendly, knowledgeable staff can deal with most email programs and services. Unlike some major ISPs, you're dealing with a real person that is knowledgable, not someone overseas with a script in front of them. A successful phishing scheme, like any con, depends upon gaining your trust. They'll use your trust of your financial institution, major vendor (e.g. Microsoft) or other authority (CRA, CRTC, FBI, phone company, etc.). They know that if you believe they are who they say they are, then you'll be more likely to follow their instructions. You trust the caller, web page or link because it appears to be someone you trust. The original Internet was used only by scientists exchanging data. There was no need for high security. But this has changed. The Web is used for e-commerce, personal transactions and more. Browsers and enhanced (HTML) email messages can be exploited, particularly if you don't understand the language (HTML markup) and therefore can't protect yourself. Be wary of any threats to close your account or emailed requests to re-submit billing and other personal information. Such requests for account information or passwords are NEVER legitimate. Be wary when using public computers. Your passwords, accounts and personal information can be retained by the browser's cache for later retrieval by anyone with access to that computer. Keyloggers can capture private information on any computer. Do not use open or untrusted secured wireless networks such as those at coffee shops and other public networks. Someone can be "listening in" on the transaction and obtain your user ID and password. Do not trust information emailed to you including any links to sites. Do not trust information on an unknown website. Always use trusted sources to obtain the telephone number or website address to contact any site requiring personal information or a password. Google is not necessarily that trusted source, especially if you click on the sponsored links. If you have been a victim of identity theft (or suspect you have), contact the police to report identity theft. I strongly recommend that you only connect to sites that are encrypted. Unsecured sites are not encrypted and are vulnerable to man-in-the-middle attacks. This is particularly important when using online banking or when shopping online — including anywhere that you are sharing banking or credit card details. 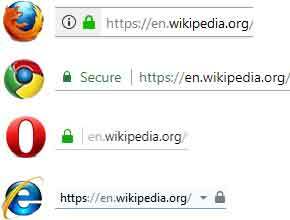 Firefox, Google Chrome and Opera all use a green padlock to the left of the address. Chrome includes the word secure. Both Firefox and Chrome display the HTTPS:// prefix; Opera does not. Safari and Internet Explorer both use a grey padlock symbol. Safari displays it to the left of the address but doesn't display the HTTPS:// prefix. Internet Explorer displays the padlock on the far right side of the address window but does display the HTTPS:// prefix. HTTPS:// Everywhere is a Firefox, Chrome, and Opera extension that encrypts your communications with many major websites, making your browsing more secure. Mozilla's HTTPS and your online security looks at the strengths and weakness of HTTPS. Your choice of web browser can make a difference in your ability to protect yourself online. Whichever browser you choose, the most recent version will usually have improved security features and/or have known security issues patched. Firefox is a much safer browser to use. As an independent stand-alone product it is less vulnerable to cross-program security issues. Because it isn't tied to an operating system or to a search company, it can focus on its users rather than those controlling the purse strings. It can perform all the features needed in a browsers without the downside. Firefox designed to protect your privacy. Firefox's Private Browsing allows you to surf without saving information about the sites and pages you've visited nor are cookies or passwords saved. Firefox gets a fresh update of forgery sites a whopping 48 times a day! Firefox is also updated frequently, so security fixes and new benefits are available sooner. Internet Explorer is no longer being developed and is not recommended for routine surfing or browsing sites on the Web. While IE may be convenient, it is so tightly integrated into Windows that any security issue in any Microsoft product puts your entire computer at risk. Google has paid free software vendors to automatically install Chrome as the user's default browsers (few people check for the preselected options when installing this software) and has replaced Internet Explorer as the dominant browser. Google Chrome has huge privacy risks, especially if you sign into your Google account while surfing (even if it is only for checking your Gmail). Google makes their money by exploiting information you provide and Google NEVER forgets. Opera browser is a relatively-safe option with some nice safety features like built-in VPN. Like Firefox, it is an independent browser. There is more about web browsers and their options on my Browsers & Plugins page including browser downloads. These tools and information sites will help you to learn more about phishing and provide you with tools to verify suspect websites and files. I urge caution when using these tools. Be sure you understand the terminology and understand the risks. Beware of suspicious warnings or popups on websites and on your computer. You suddenly hear an audio-based warning that your computer has been infected. There doesn't seem to be any solution other than to follow the instructions. A website reports that your Windows license key has been corrupted. A red box popup up stating that there is a Firefox critical error telling you to call a number. These are examples of malware designed to trap you into expensive service contracts that are scams. NEVER call the number on the screen. Microsoft warnings will NEVER include a phone number. Neither will Firefox. If a recovery phone number is displayed, you're seeing a scam. If you're having difficulty closing a popup, see Popup Warnings that Won't Go Away for solutions. CSI: ACE Insight allows you to check for malicious sites. Currently no service or security solution provides 100% detection of malicious content. The data provided is to help give a second opinion and should not be taken as fact. As with other sandbox technologies it can be detected which can skew or make the results inaccurate. Other issues might include browser incompatibilities or settings/configurations within the browser. Be cautious when checking out suspicious files. In most cases you're safer simply deleting the email along with the unopened suspect file unless you were expecting it from a trusted source. If your security program detects a problem with an attachment, you'd best delete it rather than having the program treat it even if it is an essential file sent from a trusted computer. You're best to discard it rather than risk infecting your own computer by opening the attachment. Instead, print out a copy of the file on the original computer while disconnected from the Internet. The original computer needs to have a full security scan with a current and updated software. ZoneAlarm Extreme's Threat Emulation opens unknown files in a virtual sandbox to examine what they do before you risk your computer's security. Tools for foiling malicious links and files lists a number of sites where you can upload suspect files you received as attachments. CSI: ACE Insight allows you to upload suspect files you received as attachments. The following sites deal with phishing. Phishing 101: How to protect yourself against online threats. Anti-Phishing Working Group on preventing phishing fraud. Popular phishing scams and what to do about them. 419 , fiction by Will Ferguson, looks at the issue of phishing from both the victim and perpetrator points of view. Strongly recommended. Identity theft, in a nutshell, is the obtaining of information about you that will enable someone else to impersonate "you" — allowing them to steal in your name. Identity theft is, unfortunately, a rapidly growing crime. As many as 143 million Americans are said to be affected, the company said, representing about half of the US population. Some UK and Canadian residents are also affected, the statement confirmed. — ZDNet on the 2017 Equifax data breach. One local example is the sale of personal information ( including IP, home and email addresses, passwords, credit card information and social insurance numbers ) for former customers following the bankruptcy of computer retailer NCIX in Vancouver. Not only did the company fail to ensure that the computers containing customer information were wiped, but that data was so poorly encrypted that the information is being sold on Craigslist. Whoever is responsible for the careless disposal of the company assets is to blame but bankruptcy protection should not provide leniency for the person(s) responsible for the poor security for that information, including the former officers of that company. Until such crimes are punished appropriately and to the same degree as a similar blue-collar crime, these breaches will continue. The history of data breaches. Obtaining personal information is much easier than it used to be. At one time you had to go to your bank, speak to a real person who would then compare your signature with a physical signature card stored at the bank to ensure that you were who you said you were before releasing funds or a providing a new credit card. These days credit card applications appear unsolicited in your mailbox and are easily obtained online. Verification depends upon electronic data rather than hard copies (like the signature card in the teller's hand). The convenience of inter-branch banking and online transactions has resulted in poorer security. The convenience ends when there is a problem and the bank demands paper documents that prove your innocence. Many people using electronic verification technology don't really understand it and view it as something that is imposed upon them rather than something for their own protection. That leaves only the password to protect your account access. Learn more about secure passwords and other options to protect your online accounts. Unfortunately, many folks don't take their passwords seriously. Afraid they'll forget a password, they make it simple and use the same password for every account. Your passwords are like a series of unsecured signed blank cheques. There are an increasing number of security breaches that affect everyone using online services (that is pretty much all of us). 2016 was a banner year for the number and severity of account breaches highlighted by the Yahoo! breach of 500 million accounts. It has not gotten better. Learn more about the privacy risks that these breaches entail and how you can better prepare yourself. Folks don't understand the risks of using older or unsecured technology. Many continued to use Outlook Express long after it was obsolete (and dangerous to use), just like Windows XP, the operating system it came bundled with. Both are like a skeleton key from a security point of view — easy to use but having ineffective security. Just as seat belts, car alarms and ignition keys are inconvenient, online security is too. Choose a good product and learn how to use it to protect your data and privacy. You probably wouldn't leave your car unlocked and unattended with the keys in the ignition and the windows rolled down. Especially not in a poorer neighbourhood. If you were foolish enough to do so, you shouldn't be surprised to find it gone when you returned. The Internet's anonymity provides similar opportunities to exploit your ignorance. Everyone is collecting information about you and your privacy is for sale. With your email address, they can send their advertising right to your inbox. If they know your marital status and how many children you have they can identify potential markets. Facebook knows more about you than your family and friends do. And they never forget anything. Target has even determined how to identify that a customer is pregnant before the customer themselves knows — based simply upon their product purchases. Learn deal with spam. Be careful in trying get off these lists if you didn't ask to be put on them in the first place. If the companies were ethical, they wouldn't use opt-out techniques in the first place. A phone call about your computer (or offers of a holiday special or a warning that you're about to get arrested for unpaid taxes) is scamming you. Just hang up. Be wary of any calls you didn't initiate. Caller ID can be faked. Never confirm or correct information. Never provide credit details or a credit card. Be wary when calling back a missed number, particularly if it only rang once. Calls to regular numbers in certain (mostly Caribbean) countries can be treated like 900 numbers. If YOU contact your bank or credit card company, they need information to identify you. This is normal. Just be sure you obtain that contact number from a trusted source. However, if you DIDN'T initiate the call using a reliable source for the phone number, the caller has no right to expect you to provide such information. Never give any personal information, such as a Social Security number, to a caller unless you're positive he or she is a legitimate representative of a company with which you regularly do business. If there's any question, ask for the caller's full name, title and department and tell him or her you'll call back. Certain information is your identity when you conduct business on-line. Social Insurance/Social Security Number (only legislated uses require you to disclose your S.I.N.). Be careful about releasing billing addresses and employment information as well. While the successful completion of many credit card transactions requires that the shipping address match the credit card's billing address, this information is not necessary for other transactions. People sometimes post things on Facebook or other social media (or say them over the phone) without thinking about the consequences. Former residences and occupational information. Favourite sports teams are a poor choice as this is a popular conversational topic. Most accounts are compromised by using the password recovery mechanism which invariably asks questions that many people know about you (such as those listed above). They are easy for you to remember, but also often too easy to research or ask about in a casual conversation. Cloud computing (“in the cloud”) is becoming more important as we use smart phones, tablets and other portable devices to conduct business on the go. While it may free you to access your information anywhere at any time, it also provides the same access to ANYONE in the world with an Internet connection. The biggest hacks of 2015. 2.9 million Adobe customer accounts were hacked. Winkler: The real problems with cloud computing. Companies are protecting servers, not their user's information. Sony hack: Costs of Cyber attacks and DIY data management. Cloud computing used to hack wireless passwords. Legislation is pending in some locations (including in the U.S.A. and possibly Canada) to ban encryption or to ensure backdoors are added. This is very short-sighted. Effective encryption could help reduce the risk of hacks like those noted above. Backdoors are vulnerable to unauthorized access. There is no such thing as a vulnerability that is only accessible by the good guys. Weaknesses in software, especially unknown (or zero-day) exploits, make us all more vulnerable. Yes, encryption is used by criminals. So are our roads, public utilities, telephone systems, etc. Should we remove everyone's access to those as well? It would be better to close more zero-day loopholes than to hope that criminals and foreign governments don't find them while spying on foreign and domestic targets. If you suspect you've been the victim of identity theft, the sooner you act, the sooner you can begin to resolve the issue. Victim of an identity fraud incident? Do these 6 things. The Canadian Anti-Fraud Centre at 1-888-495-8501 can help you through the process. See the RCMP's Identity Theft and Identity Fraud Victim Assistance Guide for further help. Reporting identity theft or fraudulent transactions on your credit card(s) to the credit reporting agencies helps to prevent further abuse, particularly if someone tries to open new credit in your name. You are entitled to one free credit report each year which discloses who has made requests for your credit report as well as allowing you to dispute errors. It will likely be harder to prove identity theft than to execute it. Equifax was hacked sometime between May and July 2017 but didn't report it until September. Meanwhile, Some Equifax executives sold off their holdings. Equifax has no credibility and can't safeguard your credit information. They used the least effective security possible. Shame on them. Check your bills for unauthorized credit cards or charges for goods or services you did not receive (particularly from a foreign country). You may have to file a report with your financial institution(s) and to the police. How to protect yourself against identity fraud. Canadian Anti-Fraud Centre (also known as PhoneBusters.com). Identity Theft Resource Center (1-888-400-5530). Privacy, identity & online security — U.S. Federal Trade Commission. BetterDefend's articles on identity theft. Here's what to do after your identity gets stolen has resources more suited to Americans.